Teo Soh Lung (left) and Roy Ngerng, another activist who has been investigated for political activities. Photos from International Service for Human Rights and The Heart Truths (Roy’s blog). Written by Mong Palatino for Global Voices. 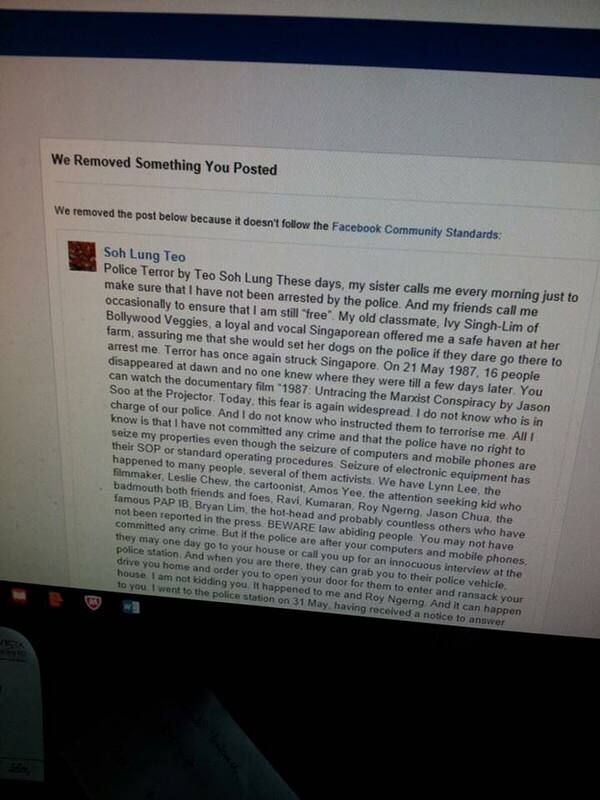 Soh Lung has been given no further information about why her post was removed. Facebook’s automated message states that it violated the company’s “Community Standards,” but did not specify which of the standards was violated. I am testing if there is a computer glitch on FB side since I don’t know where to write to in order to complain about the removal of my earlier post. It’s bizarre that Facebook would remove a post about police powers and due process in Singapore because it violates community standards – what standards have been violated here? Then again, it’s not the first time – I had a post removed ages ago, and it happened to Andrew Loh recently. It is possible that the post was removed because it was reported by a large number of people….If this is the case, then it’s troubling how this could be a new tactic to silence. Did the company read Soh Lung’s post as a “credible threat”? Her reference to a friend pledging to “set her dogs on the police” might have justified this move. On a different note, given that the company is on increasingly high alert regarding terror-related activities on the platform, it is possible that Soh Lung’s use of the word “terror” may have triggered the response. Either way, Soh Lung hopes that her future speech on the issue remains online, for all to see. ← Fact Check: does Vladimir Putin really want a Brexit from the European Union?